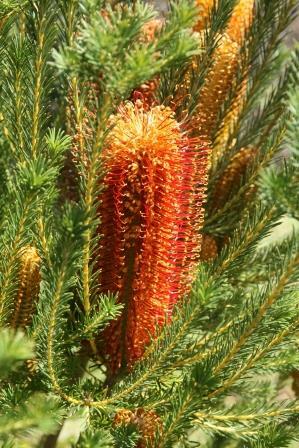 Randy tells us about Australian plants that are now available for California gardens, including Banksia ericifolia 'Fireworks' and a new cultivar (yet unnamed) of Ziera arborescens. Randy Baldwin is a partner and General Manager of San Marcos Growers, a wholesale nursery in Santa Barbara known in the nursery industry for the diversity of plants that it grows and for the introduction of new plants suitable for cultivation in California. San Marcos Growers has been growing plants appropriate to California's Mediterranean climate since 1979, and their inventory includes many California native plants, as well as vines, trees, shrubs, ferns, perennials, succulents, ornamental grasses and grass-like plants from other areas around the world. Randy maintains the San Marcos Growers website which features a robust plant database, searchable by plant type, geographic origin, and alphabetic listing by Latin name. Each listing also includes the common name, a photo, a comprehensive description of the habit and culture of each plant, and the grower’s experience with many of them. Randy has worked for San Marcos Growers since 1981 and prior to this worked for a retail nursery while completing a BA in Environmental Studies at the University of California at Santa Barbara. In his spare time Randy speaks to groups about his love of plants and maintains the web pages for the San Marcos Growers Horticultural web site. will have for sale many of the Australian plants highlighted by Randy Baldwin in his talk.